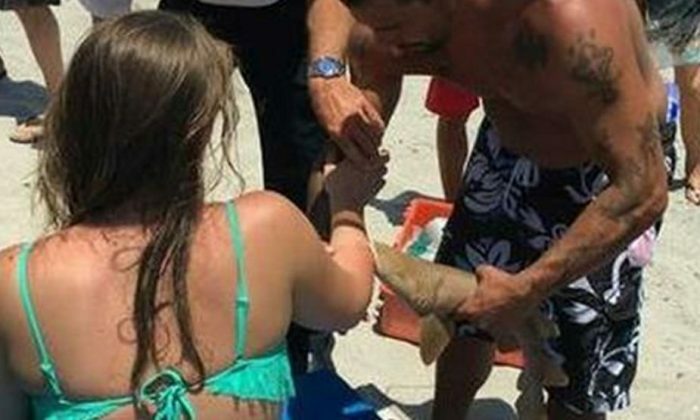 A 23-year-old Florida woman was bitten Sunday by a small shark and was transported to a nearby hospital with the animal still attached, reported the South Florida Sun-Sentinel. Photos of the woman with the shark attached to her arm were being shared en masse on Twitter and Facebook. The 2-foot-long shark refused to release its grip from her arm even after it died. Ocean Rescue Capt. Clint Tracy told the Sun-Sentinel said medical personnel used a splint board to hold the woman’s arm. The woman and the shark were placed together on a stretcher to take her to the hospital. Specifically, it was a nurse shark. They’re common along the East Coast and can grow to be as large as 14 feet in length. The National Park Service says that people swim by nurse sharks all the time without even realizing it. Attacks are rare and usually result when the shark is bothered by a hand, spear, or hook.